Successfully Added Green Laser Pointer Pen (50mW Super Executive Edition) to your Shopping Cart. Following on the huge success of its predecessor, CVGF-G219, the Blue Laser Pointer Pen (50mW Super Executive Edition), we're proud to offer you the green color option of this cool high-tech gadget. A pointer pen for the business person who wants to have the latest fashionably cool laser color this year. This executive edition laser pointer has a solid feel and perfect form factor that will instantly make itself noticeable while the unique green beam is as powerful as it is attractive. High Power, Safe Laser: This laser outputs 50mW of light in the 532 nanometer wavelength which produces a very unique green color. With a key switch and a power indicator, this model laser pointer is one of the safest laser pointers on the market for using in classrooms and meeting room settings. Multiple Uses: This is the perfect tool for outdoor tour guides, astronomers, construction workers, engineers, facility inspectors, and law enforcement personnel. With a bright and powerful green colored laser, this laser pointer is the ideal tool for highlighting information and pinpointing important and/or hard to reach areas. Also great as toys for pets, especially for cats to play with. 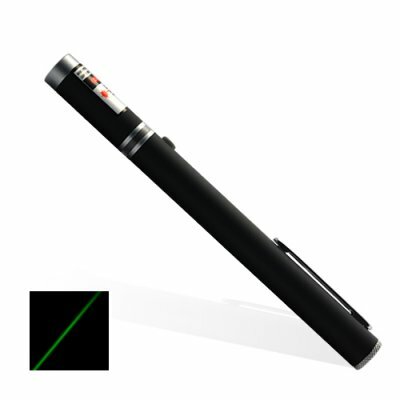 At only a fraction of the price of similar products, this unique green laser pointer is a great resale item for you to easily make some healthy profits. Put a few on your online store or sell them to your business associates when they all become jealous after seeing yours! The CVKW-G294 is available for single piece or bulk orders, so order yours today and we'll ship tomorrow! Brought to you by the leader in China Electronics - Chinavasion. The laser is strong enough to reach across any room, and is best to use at night or low light conditions for clear visibility. The maximum range can reach 8000 meters depending on the condition the laser pen is used.